The ruins of Dunhill Castle, the home of the Power (Le Poer) Clan. The ancient remains of the once mighty Dunhill Castle, seat of the La Poer (Power) family, sit high on a towering rock above the River Anne in the south-west of Waterford City on Ireland’s ‘Copper Coast’, near to the village of Dunhill. 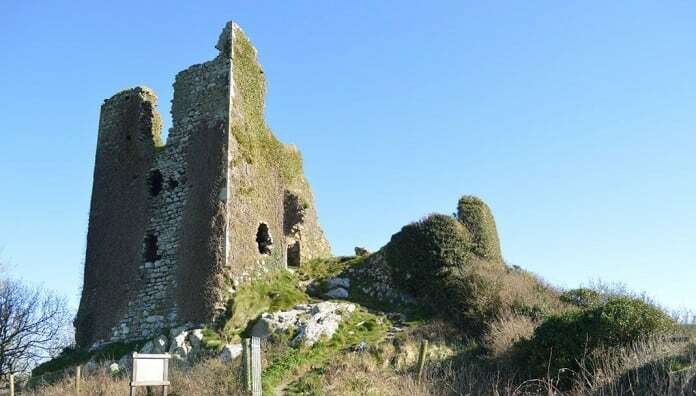 Dunhill Castle was so named after the Gaelic name of the pre-historic building which once stood on the same site: Dún Aill. It is thought that this castle, which would eventually fall to Cromwell and his men, was constructed by Sir Robert La Poer (Power), one of five members of a family who travelled with Henry II to assist him with his invasion of Ireland. They landed on the 17th of October, 1171, near Passage East, a small fishing village in Waterford. In around the year 1177, Henry II granted him control over much of what is now East Waterford, with the exception of Waterford City itself. The Irish chieftains who had previously controlled the land lost it to this influential family. However, they were not driven from the area completely; instead, they stayed to farm the land and tend the cattle as they always had. Today the most of the castle lies in ruins, though it still makes a significant visual impact, and the views from it over the surrounding countryside are simply stunning. Around half of one of the 15th-century towers remains, alongside some remnants of 13th-century walls. Back when it was first built, the small medieval settlement of Dunhill would have nestled between castle and church. The church itself boasted a small tower where the local priest would have resided. If the castle could speak of what it had witnessed over the centuries, it would tell a remarkable tale of drama, violence and romance. The Power (La Poer) family had a fearsome reputation during the 14th century, gained through their unquenchable thirst for supremacy. However, in 1345 they went a step too far by trying to take the City of Waterford, and many key members of the family were captured and taken away to be hanged. The members of the clan that remained then joined forces with the influential O’ Driscoll family. This newly formed alliance launched many attacks on Waterford over the next century, with mixed results. In 1368, after a heavy defeat at Tramore, the castle passed hands to another branch of the family. It then stayed under their control during a time of relative peace until 1649. 1649 was the year that saw Cromwell and his men rage across the country, sacking castles as they went. Kilmeaden Castle was one of the first family castles that fell, despite the efforts of Lord John, who had travelled there to help defend it. Having sacked Kilmeaden, the next castle in their sights was Curraghmore, another of the family’s strongholds. It so happened, so the story goes, that the Lord of this castle had a wise daughter who, realising that her father’s royalist sympathies would put him in grave danger, came up with a clever plan to save his life. She lured her father under some pretence or other into one of the castle dungeons, and once inside she bolted him in. She then met Cromwell at the castle door, handing over the keys to the castle and saying that her father had been called away but had wanted to offer this symbol of loyalty. Therefore, this branch of the family was able to cling on to their lands and castle while other members of the clan were overcome. Cromwell then continued on his rampage, with Dunhill in his sights. Indeed, one of the most famous pieces of folklore associated with the castle is connected with the attack on Dunhill. While we cannot ever know for certain if it is based on fact, it is a great tale that goes as follows. By the time they reached Dunhill it was being defended only by Lady Gyles, as her husband was away attempting (unsuccessfully, as we have seen) to hold Kilmeaden. Despite this, the attacking party, no doubt exhausted and weary of battle, found that they could not overcome the castle easily due to its elevated position, which was practically impenetrable on two of its sides, and its sturdy defences. So the once impenetrable castle was taken and sacked by Cromwell and the outermost defences destroyed, as was the church tower. Over the following 350 long years, the castle has been ravaged still further by the storms that are common in this part of Ireland. Records do not tell us what became of the last Lord Power (La Poer) or his extended family. It is known that what remained of Dunhill Castle passed to Sir John Cole, while the church was bequeathed to the Waterford City Corporation. Neither Cole nor his descendants ever resided in the castle, and the church was abandoned and fell into a state of disrepair. In 1912 a mighty storm raged about the castle, leading to the collapse of the east wall. Today the castle is a wonderfully atmospheric place to visit, with many of the dramatic events it has witnessed, including its sacking by Cromwell and the valiant actions of Lady Power (La Poer), seeming to hang heavy in the air. It should be noted, however, that it is not suitable to anyone with mobility issues due to its location and the state of the ruins. There is plenty of parking, and admission to the ruins is free. While you are in the area, you could also consider visiting Waterford City itself and also the Copper Coast Geopark, located around a ten-minute drive away from Dunhill Castle. Here you will find a fascinating insight into the mining industry that was pivotal to this part of Ireland for so many years. (Please note that the park is closed during the winter months).